In every city and town, there are men who have earned notoriety with their fists. Hardmen, bouncers, bareknuckle brawlers and enforcers, they are throwbacks to an age when disputes when settled in blood. 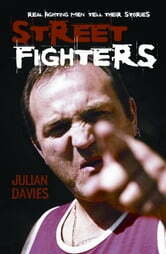 In this revealing book, Julian Davies interviews two dozen of the toughest streetfighters alive, from gypsy prize-fighting champions to martial arts experts, to lift the lid on their brutal world of violence, honour and respect. He uncovers a harrowing world of bloody gang fights, brutal reprisals, pub brawls and even deaths, in the fighters’ own words. With head, fists or feet, these are the hardest men around.